Long Tail Hair Bows are just perfect for getting your initials embroidered on. 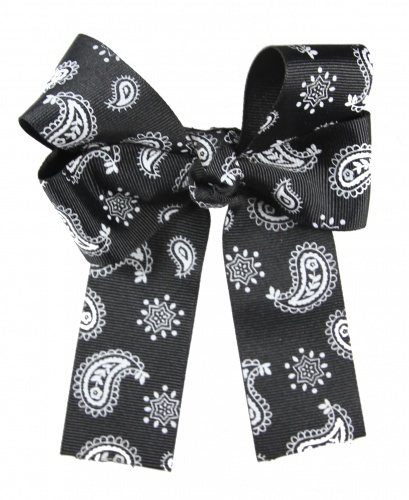 This is a black and white paisley design on a 1.5 inch grosgrain ribbon. This style bow has 2 loops on the top, 2 loops on the sides and then 2 tails coming down at the bottom. It looks great when worn on a back ponytail because it has a tail on either side, also great for the side of the face. Either way, add on the embroidered initial to personalize it.